Chevy Cruzes are assembled at GM's plant in Gunsan. SEOUL (Reuters) -- General Motors employees in South Korea voted today in favor of a strike over wages and production volumes, prompted by uncertainty over the U.S. automaker's output plans as its labor costs in the country rise. South Korea's National Labor Relations Commission is expected to meet on July 6 to decide whether to order a 10-day arbitration period, according to the company and the workers' union. Strikes occur almost annually in South Korea's auto industry. 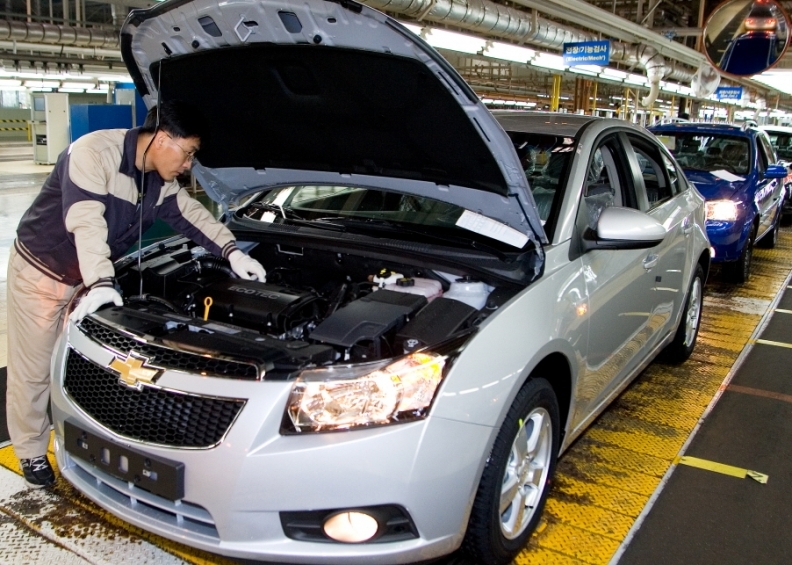 GM's South Korea operation averted a strike in 2014 for the first time in four years after an agreement on bonuses and basic wages, and following the reversal of a decision against making its next-generation Chevrolet Cruze at its Gunsan plant. Before last year's wage deal, the GM said further labor unrest could lead to production cuts in the country, where it said its labor costs have risen nearly 50 percent over five years. GM earlier this year said it planned to end production in Indonesia and cut operations in Thailand as part of broader restructuring, fuelling speculation about reductions in South Korea, which accounts for nearly one-fifth of its global output. The company has said it has no plans to close factories in South Korea but that it needs to increase efficiency. Nearly 71 percent of GM Korea's 13,884 union workers voted in favor of a possible strike over pay and production, union spokesman Yun Yong-sin told Reuters. The two sides have held 12 rounds of talks since negotiations began on April 23, a GM Korea spokeswoman said. "Both sides remain committed to reaching a fair and reasonable labor agreement based on mutual trust and understanding," the GM Korea spokeswoman said.